Growing awareness of environmental issues has led to increasing demand for goods produced from natural products, including natural fibres. The two-volume Handbook of natural fibres is an indispensible tool in understanding the diverse properties and applications of these important materials. 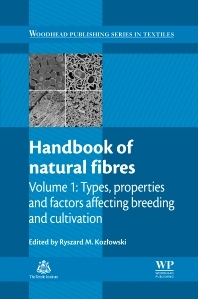 Volume 1: Types, properties and factors affecting breeding and cultivation is an essential guide to a wide range of natural fibres, and highlights key techniques for their improvement. Part one reviews key types and fundamental properties of natural textile fibres. The production, identification and testing of a range of cotton, bast, silk and wool fibres are discussed, alongside bioengineered natural textile fibres. Part two goes on to explore the improvement of natural fibre properties and production through breeding and cultivation, beginning with a discussion of fibrous flax and cotton. Improved natural fibre production through the prevention of fungal growth is explored, along with the use of genetic engineering and biotechnology to enhance desirable characteristics. Finally, the wider impact of natural textile production is discussed, using wild silk enterprise programs as an example. With its distinguished editor and international team of expert contributors, the two volumes of the Handbook of natural fibres are essential texts for professionals and academics in textile science and technology. Professionals and academics within the textile industry as well as those involved in the cultivation and farming of natural fibers. Professor Ryszard M. Kozlowski is the award-winning former Director of the Polish Institute of Natural Fibres and Medicinal Plants. He is an Honorary Fellow of the Textile Institute, Editor-in-Chief of the Journal of Natural Fibres, Scientific Advisor to the Institute for Engineering of Polymer Materials and Dyes, and Doctor Honoris Causa of the Pontifical Catholic University of Ibarra, Ecuador. Professor Koz?owski is also Coordinator of both ESCORENA (the European System of Cooperative Research Networks in Agriculture and the FAO/ESCORENA European Cooperative Research Network on Flax and other Bast Plants. He is the author/co-author of over 300 publications, including 26 books and 25 patents.